"Our babies that are ready and waiting to be matched to a Forever Family"
Our little Gong ZJ will be turning 3 years old in March. He is so sweet and his smile will melt your heart. His orphanage has told us that if we can find a family for him then they would be happy to prepare his adoption file. Our Caleb just turned 7 years old. He was born with a medical condition called arthrogryposis which basically causes multiple joint deformities in his arms and legs. Caleb was 4 years old when he came to SHH and since that time he has had 6 different surgeries on his arms and legs. Now, with the help of his leg braces, he is able to walk and go up and down the stairs on his own. He enjoys going outside and kicking a soccer ball and going down the slide. The last surgery he had helped to straighten his wrist allowing him to be able to do more with his hands like feed himself and write. Despite his physical limits, Caleb does not let that get him down or stop him from trying to function independently. He is a very smart boy...he attends English and Chinese classes and is able to communicate well in both languages. Please check out his advocacy videos that are posted on our Facebook page at: https://www.facebook.com/shanghaihealinghome/videos/1030823823733413/ and https://www.facebook.com/shanghaihealinghome/videos/278056839672341/ . Please like and share these videos. This cute little guy is looking for his Forever Family! Dang TY is 4 1/2 years old and was born with hydrocephalus. He is able to sit, stand, and walk on his own. He is able to say simple words like "mama, baba, love you". He is a sweet boy who loves to be held and cuddled. His file is ready so he can be matched at any time now. Could you be his Forever Family? Our little Pu FX adoption file is now ready! Pu FX is 7 1/2 years old and his medical conditions include scoliosis and external ear malformation. He has already had surgery on his back and he now wears a brace to support his back. He is currently waiting to have reconstructive surgery to construct an external ear canal. Right now in Shanghai the wait for this surgery is 2 years. While he waiting for his surgery, he wears a bone conducting hearing aid to help with his hearing. He came to SHH last year in order to receive speech therapy. He is doing well in his speech therapy classes and is learning to communicate some through signs and verbal communication. Pu FX is able to feed himself and walk without assistance. He is very outgoing and loves interacting with his caregiver and our volunteers. Please help us find a Forever Family for our little Pu FX by spreading the word and considering whether you might be his Forever Family. This sweet little guy is ready to be adopted and really needs a family to help him reach his full potential. 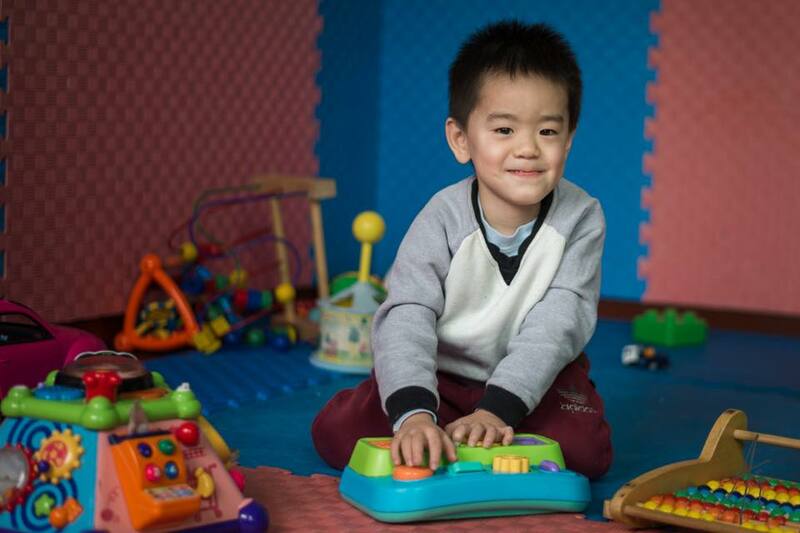 Zhao YW is 4 1/2 years old, and has Down syndrome. He is able to walk without assistance. He requires assistance with feeding himself. He loves to be held and to have people interact with him. Think he might be your son? His file is ready so send us a message for more information. If you want more information about adoption, please email Jessica Gfeller at jgfeller@charitydreamshanghai.cn. To know more about the adoption process here in China, you may visit the CCAI Adoption Services website. Just click the photo on the left.